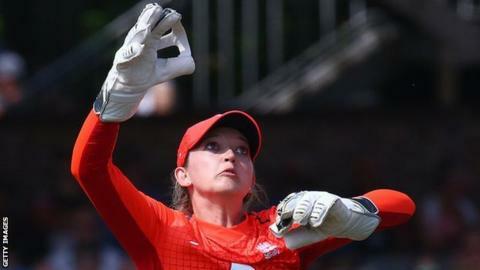 Wicketkeeper Sarah Taylor is "raring to go" for England women's one-day series in India, according to captain Heather Knight. As part of her management of anxiety, Taylor has not played away from home anywhere apart from Australia in almost three years. "Sarah has been brilliant since we've arrived, the best I've seen her," Knight told BBC Sport. "She's raring to go to get playing in India." Knight added: "Her condition needs to be managed every day, but she's enjoying being here and is glad to be with the girls." Taylor took a year away from cricket in 2016 and most recently missed England's run to the semi-finals of the World T20 in the Caribbean in November. The 29-year-old is set to be part of the England team for the first of three one-day internationals in Mumbai on Friday, but will miss the T20 leg of the tour and the trip to Sri Lanka that follows. Taylor has played only once since August, a warm-up match against an Indian Board President's XI on Monday. England eventually won that match, but not before their top order was reduced to 11-4, with Taylor, Amy Jones, Tammy Beaumont and Nat Sciver making only four runs between them. "Ideally, we would have liked more preparation, but that wasn't on offer," said Knight, who made an unbeaten 64 to guide England to their target of 155. "It is what it is and we have to deal with it. "The girls seem good and have practised very well. As a batter, you want more time in the middle, but you have to be ready mentally and prepare as well as you can in the nets." The matches in India and three ODIs in Sri Lanka are part of the International Cricket Council's Women's Championship, from which the top four teams will qualify for the 2021 World Cup. England, the defending champions, currently find themselves in seventh place, albeit with games in hand on the teams above them. Knight does not believe that the pressure of reaching the World Cup will be a factor in the series against India, the side they beat in the 2017 final. "We haven't looked at it like that," she said. "We're focusing on this series and how we can be successful out here. "It's a tough place to tour, challenging on and off the pitch, but that's exciting for us."